As international financial markets have become more complex, so has the regulatory system which oversees them. The Basel Committee is just one of a plethora of international bodies and groupings which now set standards for financial activity around the world, in the interests of protecting savers and investors and maintaining financial stability. These groupings, and their decisions, have a major impact on markets in developed and developing countries, and on competition between financial firms. Yet their workings are shrouded in mystery, and their legitimacy is uncertain. Here, for the first time, two men who have worked within the system describe its origins and development in clear and accessible terms. Howard Davies was the first Chairman of the UK's Financial Services Authority, the single regulator for the whole of Britain's financial sector. David Green was Head of International Policy at the FSA, after spending thirty years in the Bank of England, and has been closely associated with the development of the current European regulatory arrangements. Now with a revised and updated introduction, which catalogues the changes made since the credit crisis erupted, this guide to the international system will be invaluable for regulators, financial market practitioners and for students of the global financial system, wherever they are located. The book shows how the system has been challenged by new financial instruments and by new types of institutions such as hedge funds and private equity. Furthermore, the growth in importance of major developing countries, who were excluded for far too long from the key decision-making for a has led to a major overhaul. The guide is essential reading for all those interested in the development of financial markets and the way they are regulated. The revised version is only available in paperback. Howard Davies is Director of the London School of Economics and Political Science. David Green is Adviser on International Affairs at the Financial Reporting Council. "Global Financial Regulation remains an essential guide. This is despite the fact that, as they write in the Update, 'Time seems to have speeded up in the world of financial regulation' since the first edition was published in spring 2008. That Update is ... a crucial part of the second edition." "A superb account of the international regulatory system, together with a set of proposals for its reform that are highly relevant. While largely written before the market disruption that began in August 2007, subsequent events have tended to reinforce rather than invalidate most of its prescriptions ... This book is wholly authoritative and its judgments carefully reasoned." "An admirable starting point for coming to grips with the historical and institutional background to the ongoing debate." "Given the experience of the authors, both of whom have participated in international regulation for the best part of two decades, it is of course masterful. It is comprehensive and clear. It is not easy to describe a structure that has grown incrementally, mostly in response to crises in one part or other of the global financial services system but the authors achieve it with apparently effortless ease." "The regulatory architecture of international finances has hardly changed since the book's publication, which will probably make Global Financial Regulation a useful book for professionals in the financial markets for a long time to come." "This book is both an excellent review of how we got to such an eclectic mix of regulatory structures around the world and a provoker of thoughts as to how they could be improved." "The authors' ability to cut through the myriad of information and arguments on topics like Basel II and present the 'essentials' makes it a lively and easy read. That doesn't mean that it is simplistic, and even those who are closely involved in regulation will find it offers some fascinating insights." "For once the cover does not mislead. This is indeed 'the essential guide'. It sets out, elegantly but simply, to describe some of the ways in which international and national financial market regulation has evolved, some reasons why it evolved and some reasons why it has failed to keep abreast of innovation." 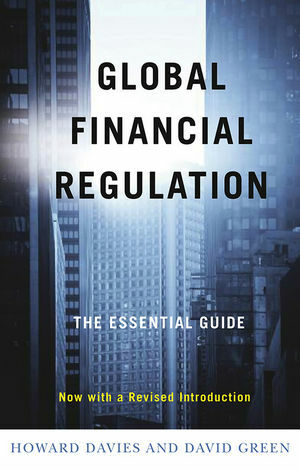 "A masterful, succinct and superbly clear treatise on financial regulation. I am sure it will be very well received by regulators, financial practitioners, academics and their students. This book is just the type of overview that has been needed for some time." "Financial regulation matters. We’re all poorer when banks run amok or markets lurch from crisis to crisis. But most books about the rules and rule-makers of the financial economy tend to be dry and impenetrable. Davies and Green have performed an impossible feat of public service: they have demystified Basel ll, credit derivatives and all the other jargon of the global financial priesthood in a lively and entertaining way." "Global Financial Regulation is a timely review of a subject which engages the attention of both national and international authorities. Howard Davies and David Green bring substantive experience and a strong point of view to the needed debate." "Financial regulation has leapt to the top of the international economic agenda. Seldom can there have been such a well-timed book. The authors are very distinguished experts and practitioners in the field. Davies and Green achieve the almost impossible feat of making 'regulation' interesting."